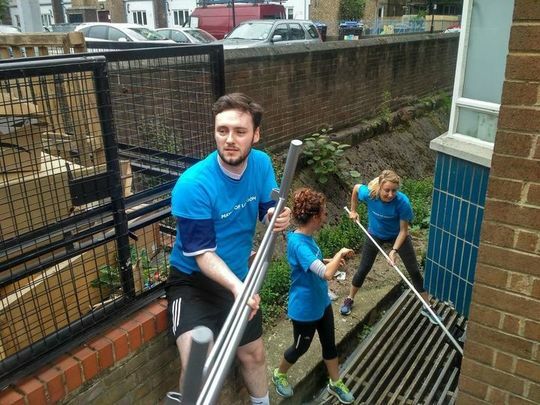 138 runners ran 7.0km to help their local community in Westminster. Back once again! 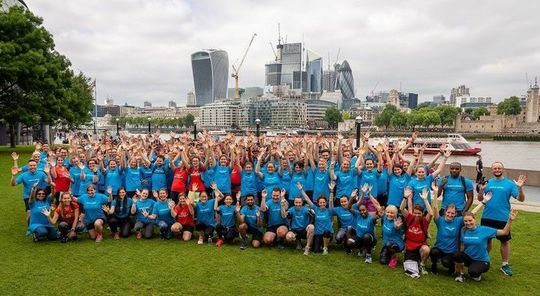 For the third year in a row GoodGym partnered with Team London, the Mayor's Programme for volunteering and social action, to run and do good all over London. 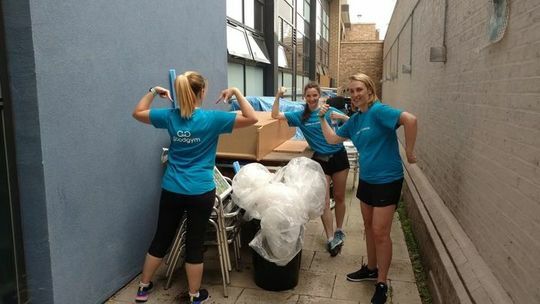 This year 134 runners marked national volunteers week in style with 12 tasks and 100 hours of volunteering! 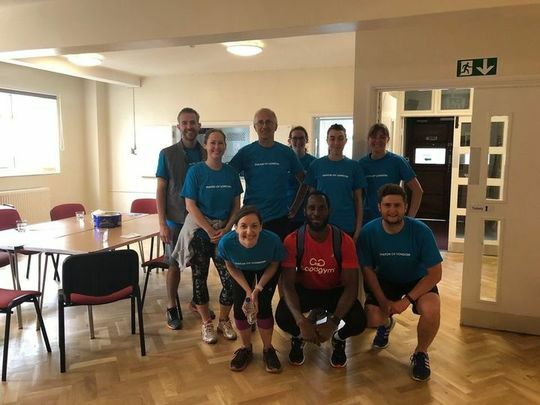 A Monday afternoon in Aldgate became GoodGym Ealing on tour as five of our usual suspects grouped together to take on flyering for Aldgate Community Events. 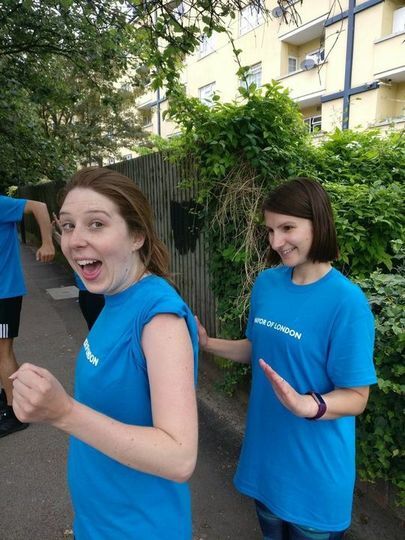 At the last minute we also happily adopted GoodGym hero Beth Nelson who is know throughout the GoodGym-asphere! 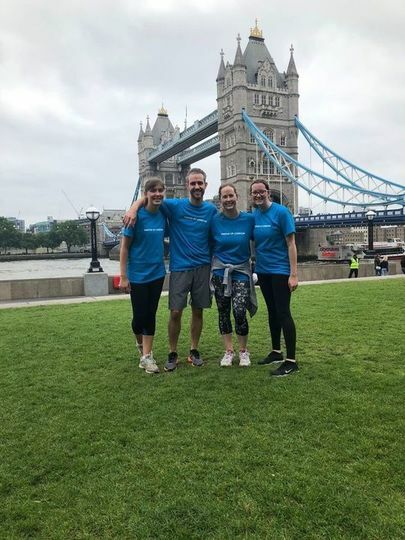 We started our journey by running over the iconic Tower Bridge before continuing on to Aldgate to help them promote their local festival happening in a couple of weeks. 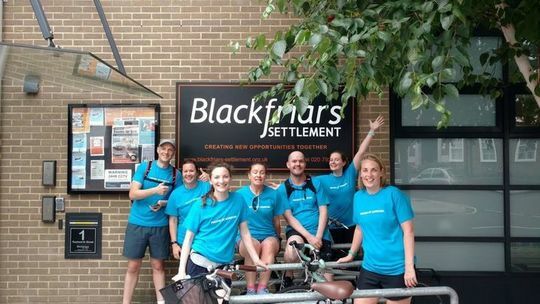 The task owner was so delighted to see us and enthusiastically told us all about the event and what they are doing to help the local community. She armed us with stacks of flyers before sending us off in three different directions to distribute them to local businesses. 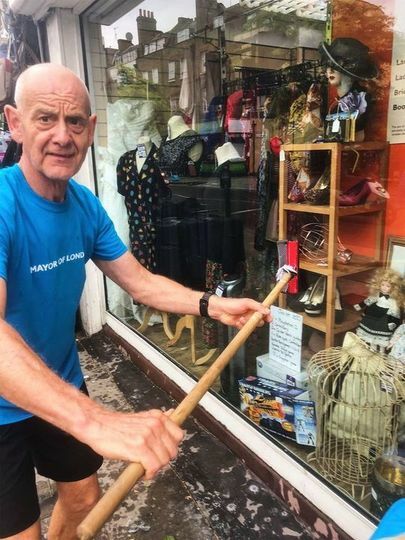 Everyone came back 40 minutes later with empty hands and lots of positive feedback with stores, hairdressers, barbers, newsagents, coffee shops (the list goes on!) all happy and interested in supporting the event. 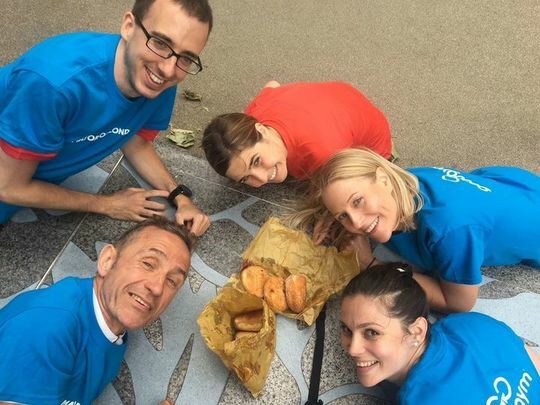 Beth and I even managed to swing it so our route went past the brick lane beigel shop, a treat of beigels and donuts were a great reward for our little teams afternoon of hard work and doing good! 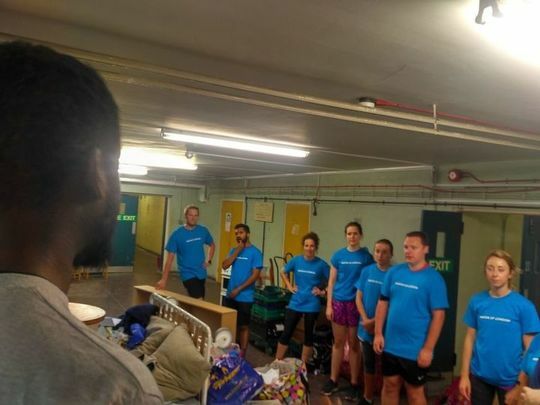 8 runners ran 5km to Blackfriars Settlement to help clear a store room for them to use in their work with the local community. When we arrived, we met the lovely Tina and Eddie who gave us a brief history of the organisation and what it does. 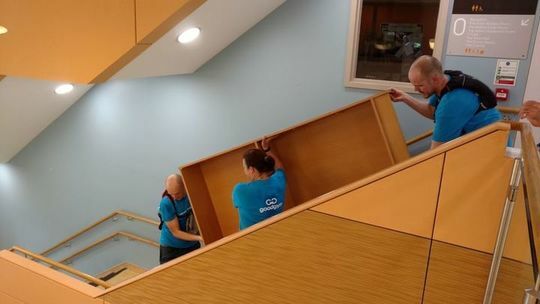 Then they showed us our task; tackling an office upstairs packed with boxes of files, old furniture, and even bags of Christmas decorations. The group got on it right away, passing boxes corridors, carrying some bits to a storage area out back, and making light work of the task (which Tina told us would have taken them ages without our help). 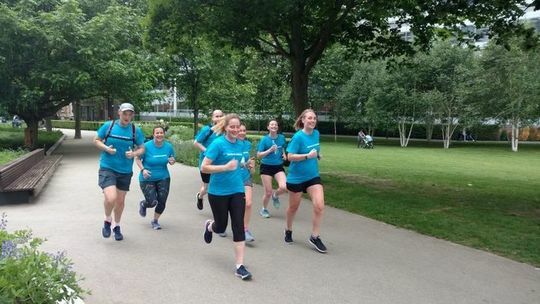 Afterwards, we ran back to City Hall, and enjoyed a couple of fitness games (always love a bit of Duck Duck Goose) before we stretched off and headed off. 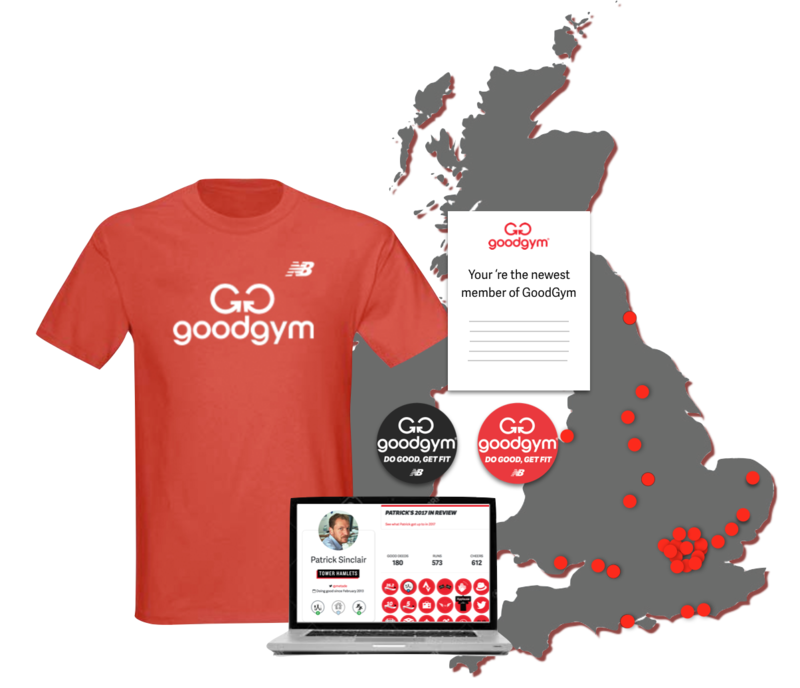 Mondays for some GoodGymers would be group run day where a sea of red t-shirts would be bobbing along the pavement to a local community group to help with a task or two. For those who did group runs on a Monday this was an opportunity to gain a double deed. 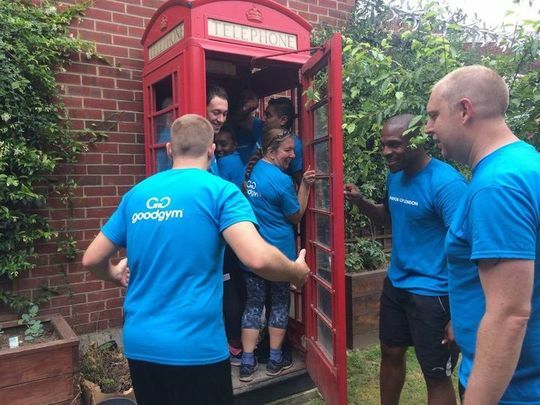 For GoodGymers it was just a regular thing to be out there doing what we are known for volunteering and helping in the fight against isolation. 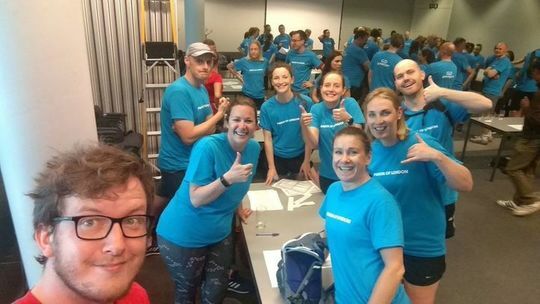 So the commencement of national volunteer week did not really affect what we are used to, however, it did bring together the Mayor’s office and GoodGym together again for the 3rd year in a row working together and getting new volunteers and employers to donate their time to some worthy causes. "How much do you know about drugs?" 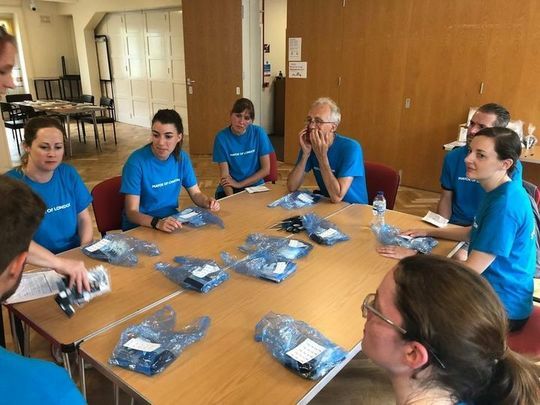 I led a group of 8 volunteers some new to volunteering and some who volunteers on a weekly basis to Hope UK, a charity which provides drugs and alcohol training to children, young people parents and other organisations. After running 2.5 miles we arrived at our destination rearing to go where we were met by our contact who had laid out an assortment of bags with drugs (replicas) and numbers. Unlike those who will be tested on their knowledge of identifying which is which we had a head start in that we were told what they were and got the corresponding numbers to each pack. We all mucked in and got to number the packets of drugs then bagged them up in batches of 10s. After the numbering and sorting was completed we even had time to do some cut outs this was for another service offered by hope in which they work with young children in identifying body parts (operations) but with arrows. As usual time ran really quickly and it was time for us to head back to City Hall. 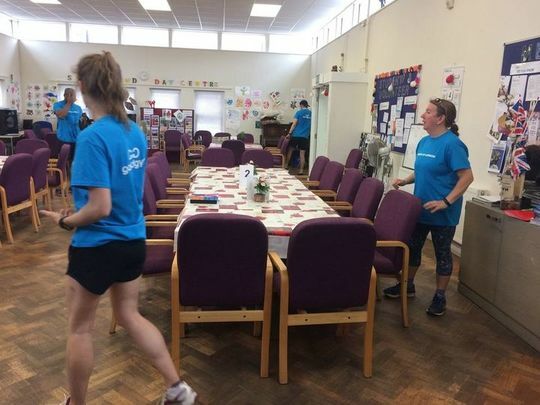 Debbie thanked us for a job well done and informed us that what we had done in under an hour would have taken their volunteers a lot longer to do as we as a team put in 8 and a bit hours of work as oppose to an hour here or there by the regular volunteers that normally helps. 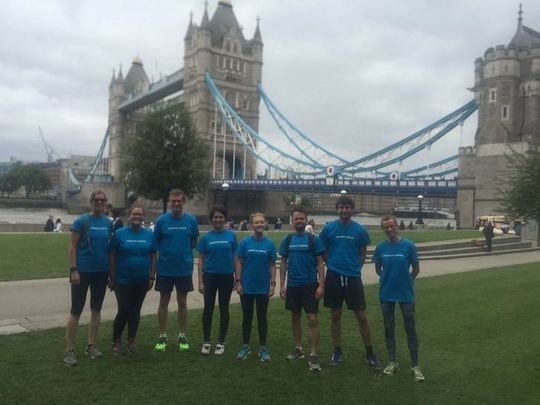 The nine of us that made up Team Get Kids Going kicked off our run with a warm up overlooking the Thames, noting how beautifully our bright blue tshirts matched the painting on Tower Bridge perfectly. How satisfying. After a round of squat jumps, high knees, twists and heel flicks, we had a quick discussion about the best ice cream flavours (very important) and set off in the direction of our task. 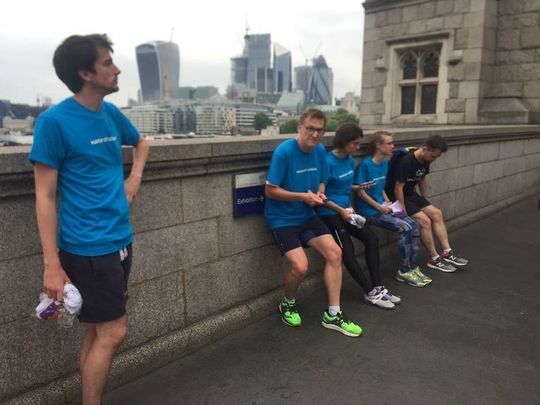 Although it was only a mile away, we took the first section over the massively busy Tower Bridge fairly steadily, dodging the crowds, until we could stretch out our legs a bit in the last section of the run - stopping for a few squats along the way of course. We soon arrived at the amazing Get Kids Going - a charity which gives disabled children and young people the opportunity to participate in sport. They provide them with specially built sports' wheelchairs, inspires them to compete in sporting events, from start to paralympic level. Our job tonight was to make up packs of information which will be sent out to runners and cyclists competing in major events to raise money for this great cause. 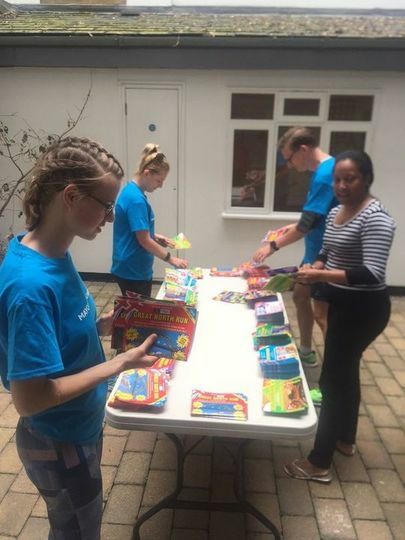 We split into two teams, and got stuck into making up the packs by walking round the table picking up pamphlets in a highly efficient fashion. 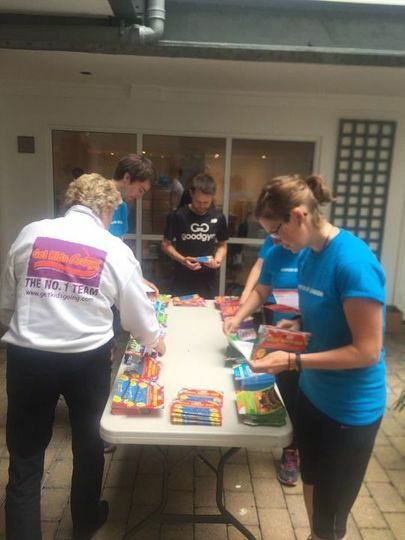 Half an hour later we had made up no less than 1300 packs, which by anybody's standards is pretty great going! 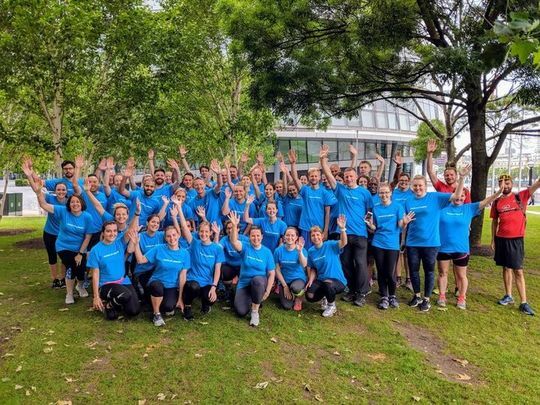 Waving goodbye to the lovely staff, we made our way back to City Hall, stopping only to do a few bursts of Tabata and finishing off with a nice planks, and some even nicer stretches. Brilliant work team! Meeting at City Hall, we were all really excited. It was brilliant to see so many volunteers! 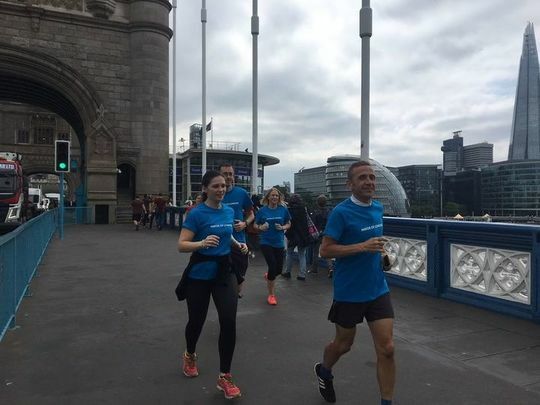 After the photo call, we had a quick warm up in our group, and set off over Tower Bridge with Alice backmarking for me. We arrived at our task, needing a quick phone call to double check which door we needed (! ), and made our way in. We were greeted with a hugely warm welcome with juice and waters and shown the garden. It had clearly been a really nice little garden but weeds had overtaken it a bit. We set to work: Stephen and Sophie worked in the back garden trimming back the bigger plants, while Fran, Alice and I worked in the front removing weeds. The time flew by and half an hour later we had filled 9 (!) bags of garden waste. Catriona at Look Ahead was delighted and can't wait for her next GG visit. We said our goodbyes and set off back to City Hall. We stopped for a very quick fitness session, working on running technique, before arriving back at base for a stretch. The team said they all want to try a bit more GG tourism and see more groups and areas now they've met so many people across London (and beyond) at the event. 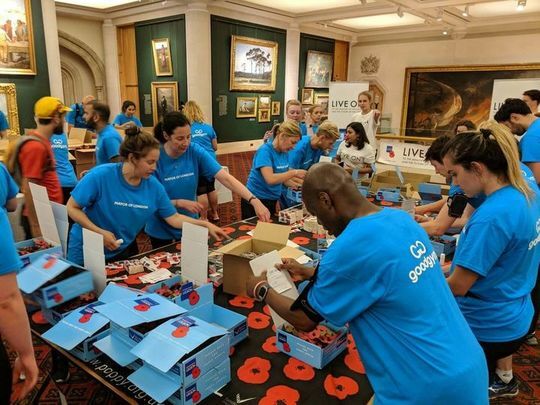 48 runners ran 4km to help the Royal British Legion make poppy appeal boxes! 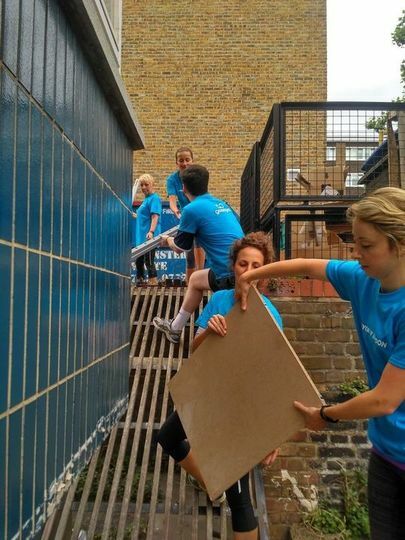 We had the biggest group of all the charities but lucky we did as we had a mammoth task! The pressure was on to make, fill, label and pack 1000 poppy appeal boxes, in attempt to beat last years number of 986. We had a nice little jog down to Guildhall and as soon as we arrived, the production line began. Everyone got stuck in and got straight in the zone, working as fast as they could on their stations! We had one group making boxes, one group filling them with poppies, one group labelling and some people packing and transporting them to where they needed to be. It was amazing to witness and lovely to see everyone helping each other out. If one station was struggling, the labour was redistributed to keep the machine running smoothly! We had 40 minutes to complete the task and after just 30 we were done, absolutely incredible!!! Can't wait to see those boxes all over London in a few months time! Let's up the target for next year shall we? 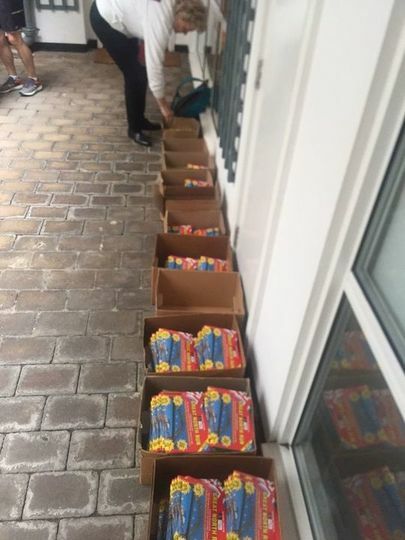 1500??? 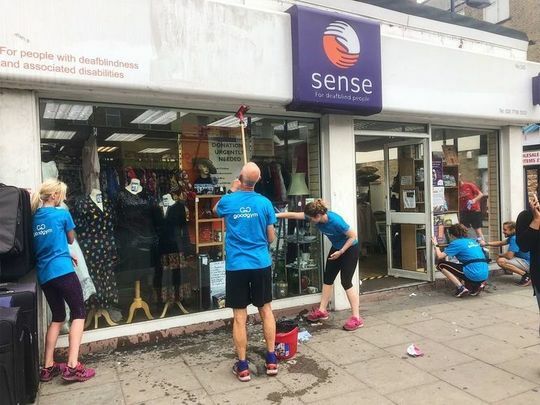 The seven members of team Sense were given the mission to clean the windows of the charity shop in Camberwell. 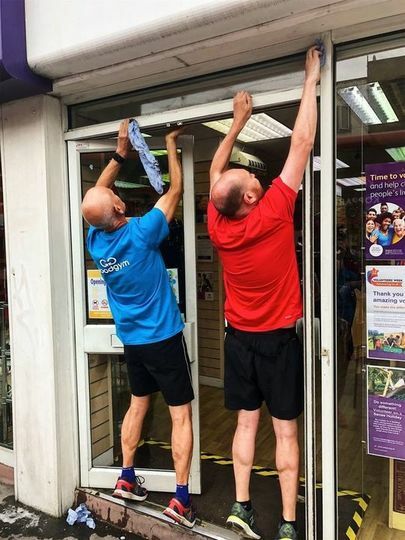 With two miles to cover to get to the shop, the team wasted no time it getting going - only stopping briefly for glute activation drills on some well-placed steps. 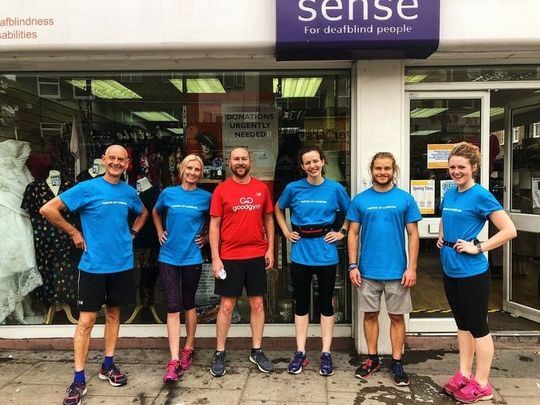 Heading south down Tower Bridge road the group bonded over the love of running and doing good and before long they arrived at the Sense charity shop a little sweaty but ready to get stuck in. Armed with soapy water, a squeegee and plenty of cloths the gang set to work cleaning the windows and paint work. In less that 20 minutes the job was done and the team were jumping for joy. 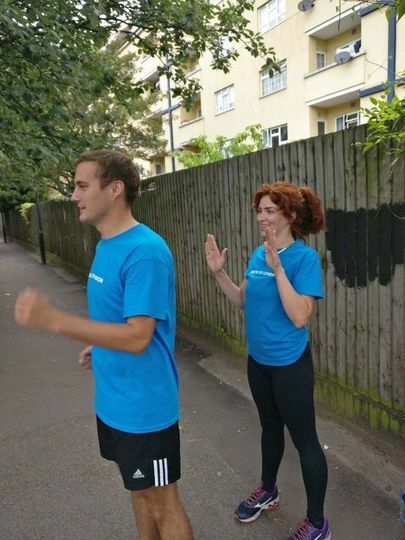 Even better still there was still time for a short fitness session in Faraday Gardens where the crew learnt about high-five fartlek intervals from Goodgym trainer James. All that was left was a couple of miles of easy running back to base and some light stretching. 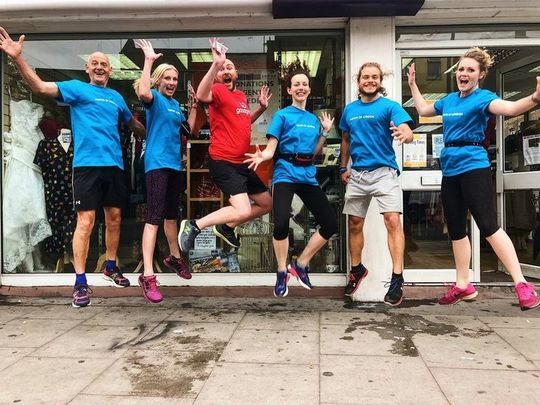 8km done and some super shiny windows in Camberwell, great work team! 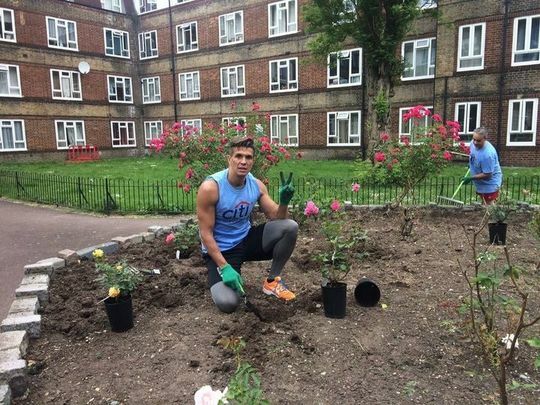 Our task for the day was to help out at Southwark Age UK which was 2km away from City Hall. 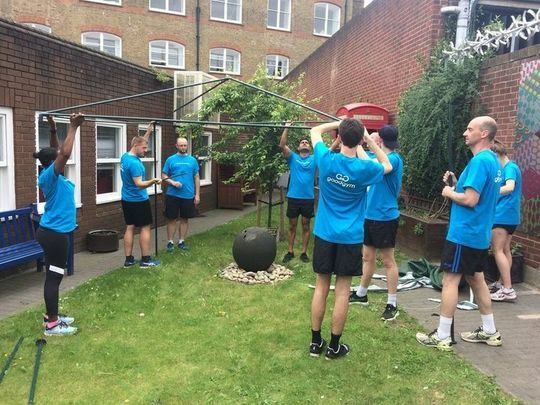 Once we arrived, the gang got started straight away helping take down a fabric gazebo in the garden. This took less than two mins. 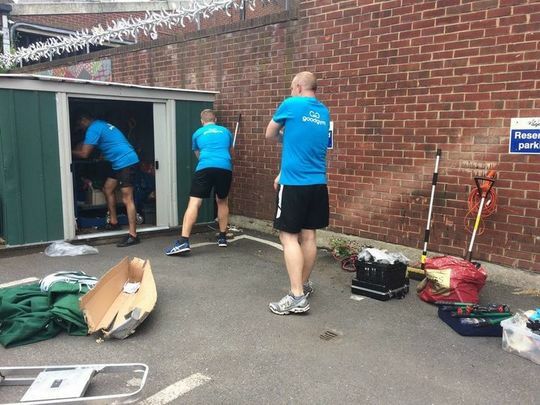 So then 5 people were draughted into helping clear up after the centre’s activity room. This involved wiping down tables, rearranging chairs and packing away bit and bobs. 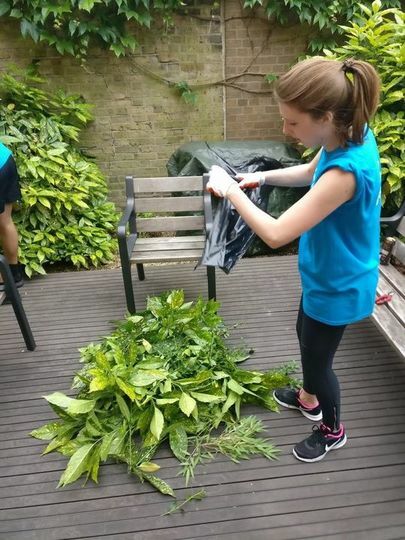 The other half of the group pulled everything out of the garden shed and repacked it; whilst Nykolette mowed the lawn. 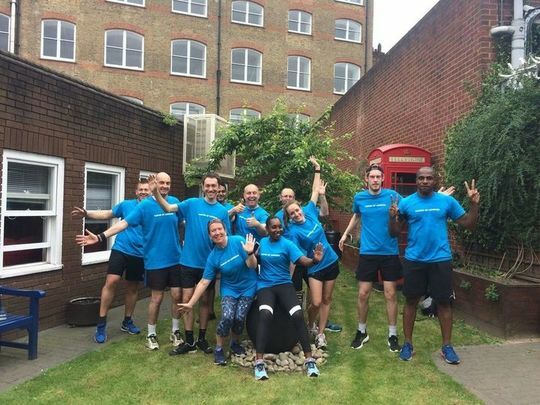 Great to see so many goodgymers on the run, including Debs from Bristol, plus 3 chaps from GSK came down all the way down from Hertfordshire. Lovely stuff! 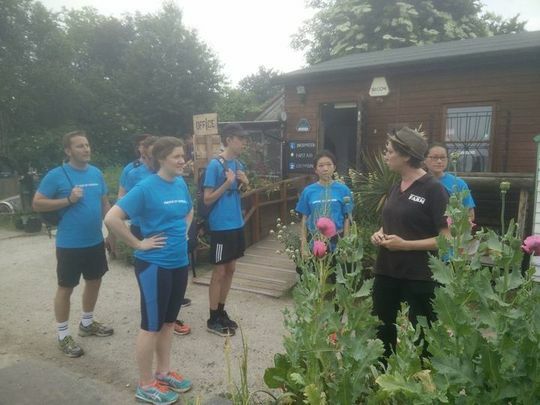 We went to Spitalfields city farm, a true oasis that has been going for over 49 years in the heart of the city. 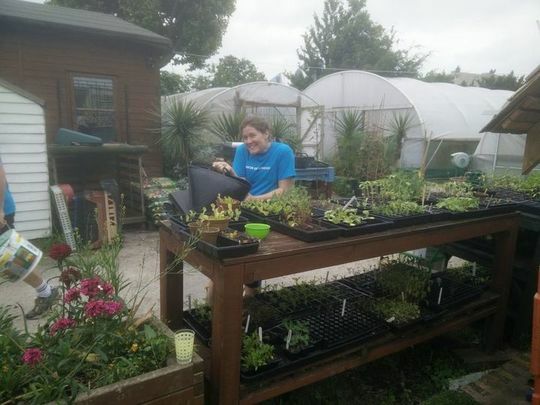 Our job was to take buckets of water from the duck pond, which needs emptying and using it to water all of the lovely plants and veg across the farm. Two member donned wellies and we were off to work. It was a real work out for the arms carrying the buckets but we made a real dent in the pond water levels. At the end, the pigs got let out of their daytime pen and we got to race them up to their night time pens. They were getting lunch so they ran very fast. And with that it was back to base. 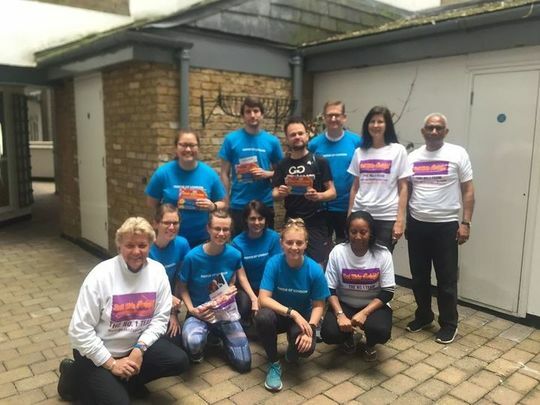 10 runners headed south to run 3km and help out the South London Mission. 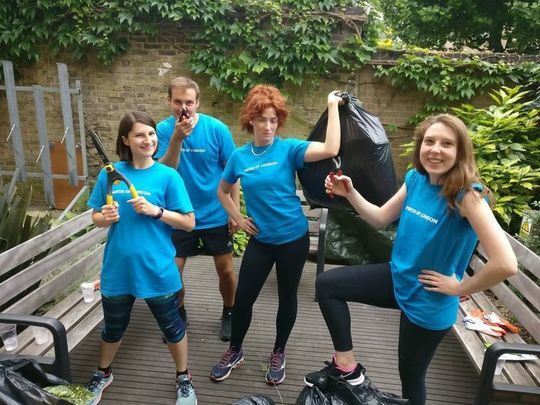 The task was peak GoodGym - fill a skip with as much junk as possible in 40 minutes. On arrival we were met by Peter who has been helping out at the organisation for 10 years. He explained that the Mission had been based at Bermondsey Hall since 1900 (!!) offering a variety of outreach services to people in the local community. 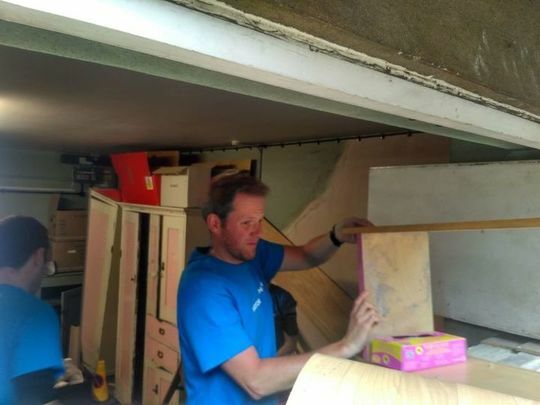 The Mission receives LOADS of donations, not all of which can be used and so had built up an impressive pile of items which were sadly destined for the skip. 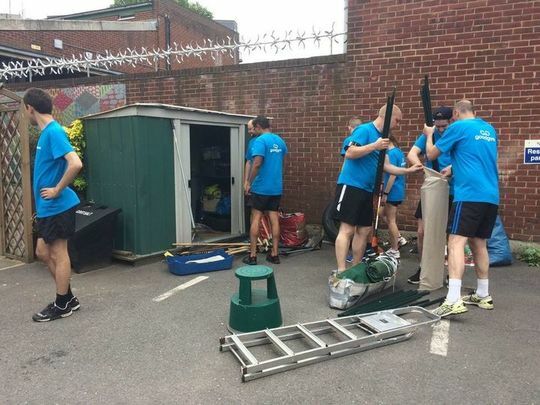 Within seconds our 10 heroes had formed a human chain shifting heavy items out from the building, up a ramp and into the skip. Old mattresses, broken wardrobes and some vintage typewriters all made their way outside. In no time the skip was full and after a huge thanks for the team we were off on our way. It was a short run back to base and so naturally we stopped off for some ab-aching circuits. Leg raises, sit ups, burpies and my favorite, Russian twists all helped build up a sweat. Before long we were back at City Hall, stretching our legs and feeling proud at a job well done. Working hard we lost track of time, a 4pm return to City Hall was obviously a dream... returning to the kitchen we realised that we didn’t make sure to set a meeting time... with three teams in 3 hidden locations, it seemed impossible to find each other and coordinate a group return, so we improvised and went back in sections, all made it back with a smile on their face! 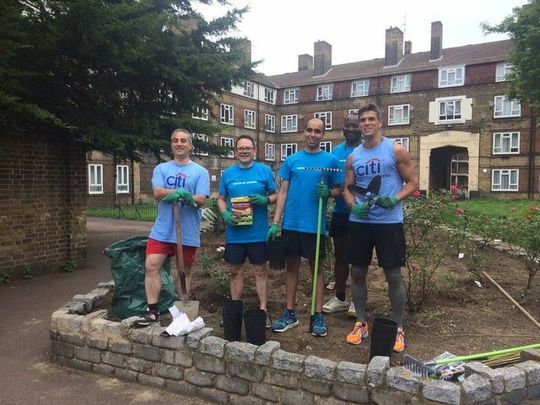 A subteam of Citigroup set out to Crol and Co Coffee to do some community gardening. It transpired, there was some running pedigree in this group. Anmol runs a sub 19 parkrun, and Winston had done the London Marathon, albeit it a few years ago. 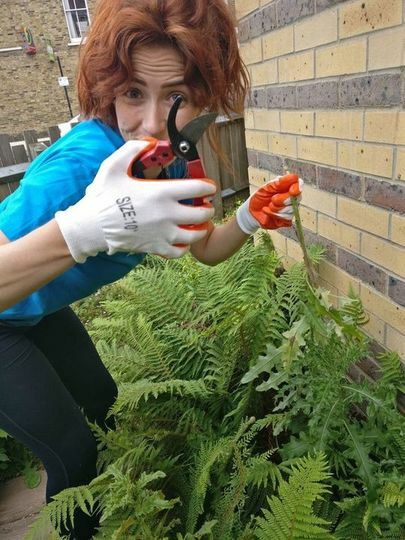 We were met there by Susan who is active in Bermondsey, and has taken it on herself to beautify the local outside communal areas. Susan tasked us with planting 30 roses from pot to ground. 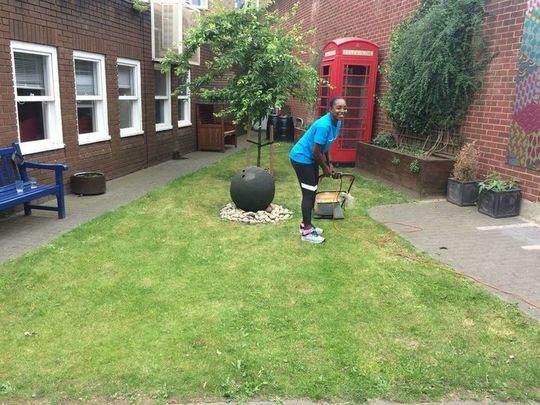 First, we prepared the ground by weeding, and Winston gave the whole area a rake to break the soil down. 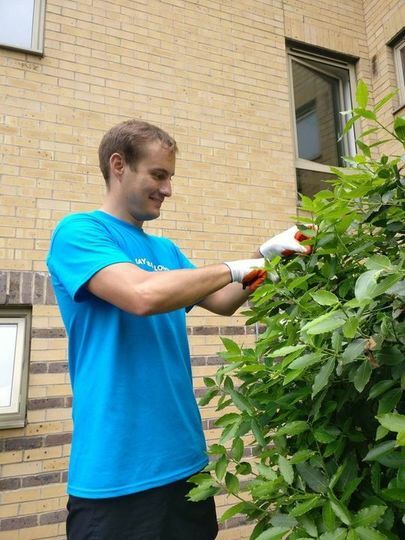 Then garden trowel in hands everyone set about digging. 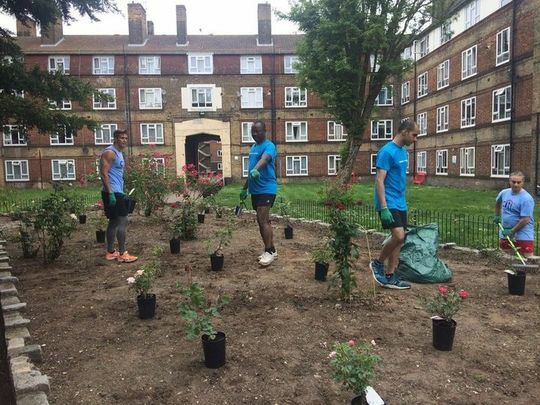 I figured this lot might be competitive so challenged them to see who could get the most roses in the ground. With the added pressure of a time limit everyone was on their hand and knees working hard. Domino! The team brought the task in under time. 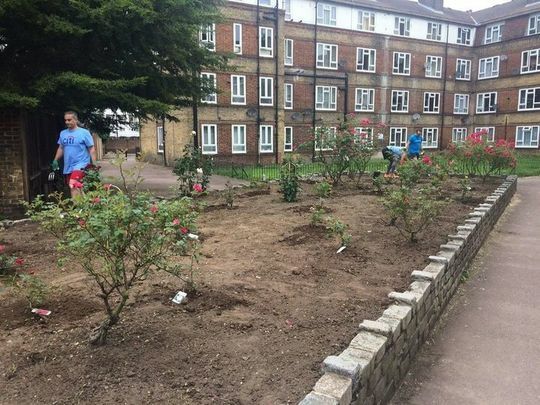 I know Susan really appreciated everyone's efforts, and it is going to look blooming marvellous when the roses grow. 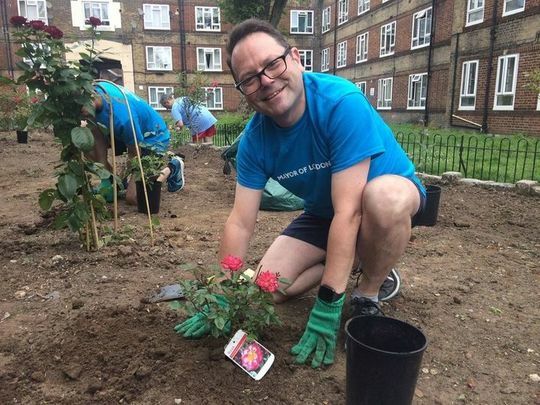 I hope local people will borrow pride from the rose garden, we did. All in all, out and back we ran 4km. Lastly, it was encouraging to hear a few of the group were thinking of continuing their running. Do. Great Fun. Well done everybody. 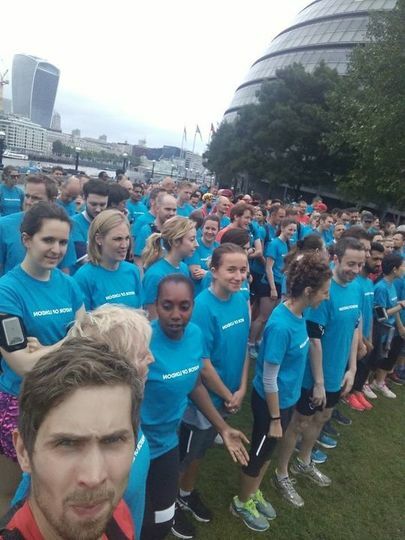 "one chap from GSK on Polly's run"
Head of Group Run Operations at GoodGym central. Likes to run a really long way.